As the curtain rises and a herd of performers jaunt onto the stage dressed as buffalo, wearing ornate vests covered in tufts of fur, rearing back their horn-adorned headpieces in excitement, and singing in anticipation of the arrival of the Chief’s newborn son, The Calico Buffalo very quickly grabs the audience by their—in this case metaphorical—horns and plants them firmly in a rich and colorful fabled land. Based on the book of the same name by EJ Stapleton, The Calico Buffalo gives a close look at a day in the life of a herd of wild buffalo. Not only are these walking and talking buffalo, but they are also animals which struggle with similar problems previously assumed exclusive to the human race—namely, this herd has a major problem with equality across all buffalo. When the Chief Buffalo’s first-born calf is one with a hide of bright orange and white–completely different than the dark brown and black of the rest of the herd, the Chief (Rhys Gilyeat) and his wife Willa-Mah (Rachel Rhodes-Devey) fear for the challenges their son might face living life as an outcast. In order to keep his secret in the family, the young Bora-Boh (Zachary Infante) is taught to cover himself in mud every single day as a way to hide his differences, but given no explanation as to why. Running around the stage with wild abandon, Infante is an affable protagonist who is exuberant from beginning to end. Even despite the hardships the young calf faces, Infante is bright-eyed and fully committed. Every hero needs a best friend, and that’s exactly what Infante’s Bora-Boh finds in Bittle, a toad with his own differences. Bittle, played by Brooke Shapiro, is a fun little guy with quite the big “boom.” Goofy, a little zany, and a nice compliment to Infante, this friendship is the most important relationship in the show. In recognizing each other’s differences, the pair come to realize that maybe these so-called “flaws” aren’t actually a burden at all, rather these are the things that make them unique and special. In “Two Stars,” Bora-boh and Bittle take a major stride towards owning their individuality through a strong and supportive friendship. 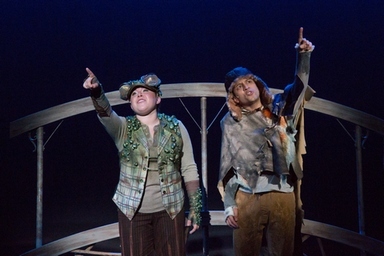 The script (EJ Stapleton) and score (Peter Stopschinski & EJ Stapleton) of The Calico Buffalo is one which mixes classic music theater with a myriad of contemporary styles. “Day of All Days” is a rustic anthem which feels adamantly American; “Mother Nature’s Mistakes” provides an oddly romantic vision of a fearful pack of wolves. In an “eleventh hour” moment, the character known as the Ancient (Anthea Neri) brings down the house with the diva-inspired “Got Good Soul.” For something which by genre is considered “children’s theater,” the scope of the entire musical is quite large in scale, and anything but childish. Overall, this is a fun-filled evening that does not cater to children in the least. For this approachable and enjoyable new musical, director Craig J. George and choreographer Billy Sprague, Jr. have created a thoughtful and well-conceived production which is welcome entertainment for an audience of any age. To assist in the suspension of disbelief in watching a walking-and-talking herd of buffalo, the costume design by Claire Aquila is positively campy, and suits the production perfectly. 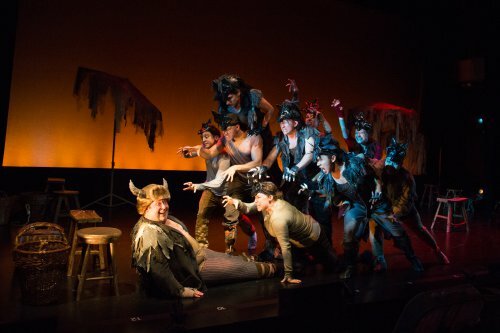 The Calico Buffalo is a highlight of the 2015 New York Music Theatre Festival which is backed by solid performances and a strong creative team, and teaches a lesson which is meaningful for any individual—whether child, adult, or animal. An obnoxious NYC real estate broker pulls strings to get a heart transplant in this black comedy. Initially confounding, it builds to a satisfying climax. Splendid revival of the "Moonstruck" author's early, short, romantic dark comedy about two troubled misfits falling in love in a Bronx bar.